Lorena Ochoa is a rarity in the world of professional golf…she went out at the top of her game. 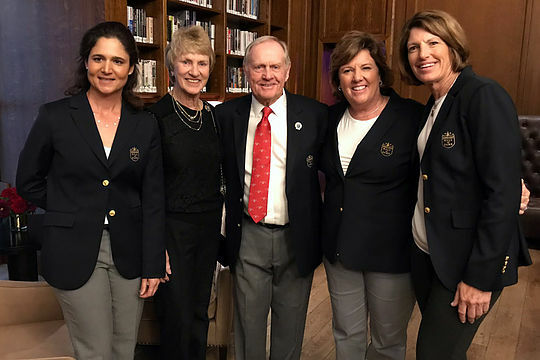 Yet almost eight years later the world is still lauding her talents and Ochoa was honoured last weekend when she was admitted to the World Golf Hall Of Fame. Ochoa was part of the Hall of Fame class of 2017 alongside former Master champion, Welshman Ian Woosnam, Americans Meg Mallon and Davis Love III and the late British writer Henry Longhurst. At just 35, Ochoa was easily the youngest inductee of the evening. The amazing thing Ochoa has now been retired from the game since she was 28 after deciding to put family and home life ahead of any golf career. Ochoa was her typical endearing self as she accepted the award, even joking that it was more stressful than giving birth. Yet this marvellous Mexican told of her amazing journey from a struggling childhood life in Guadalajara where money was scarce, she said. Ochoa paid tribute to her three siblings “for all the things you couldn’t do because of my golf and you never complained. I remember only love and support,” she said. She told the audience, including Jack Nicklaus, of her first trip to the World Junior Championships in California when she was just eight-years-old. “To tell you the truth, I just wanted to go to Disneyland,” she smiled. Ochoa went on to win that event five times in a row. “And, yes, I did get to Disneyland,” she said. Those junior wins were a prelude to a meteoric rise. After two years at the University of Arizona, Ochoa joined the LPGA Tour in 2003 at age 22. A year later she had her first title, and quickly racked up more than two-dozen wins, including majors at the 2007 Women’s British Open and the 2008 Kraft Nabisco. Her last win came just six months before she made the decision to walk away from the game.